Hi there blog friends, conquering another item I’ve had on the side of my desk for months. Are your ready to do more scoring and folding? Well then, I have another tutorial for you! This one will allow you to make a Decorative Border Folded Envelope to accommodate a 5.5″ x 5.5″ card. There are two options for folding and many different options for embellishing – all of them will give you a different look. 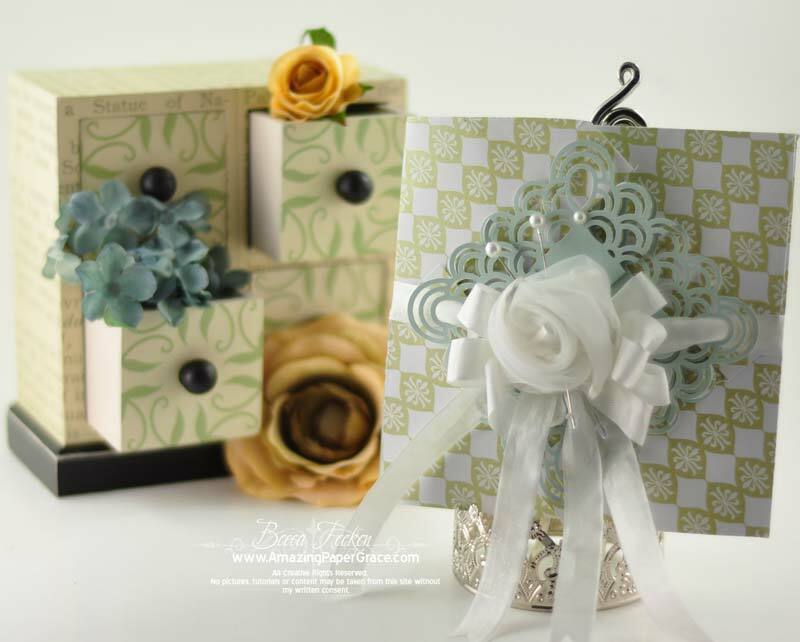 On the sample above I’ve used Spellbinders™ Classic Edges One and Spellbinders™ Classic Decorative Inserts Two. For the next sample I used a Martha Stewart Corner Punch and a Martha Stewart Border Punch, along with a rolled rose, pearls and seam binding. For the last sample I used a Martha Stewart Border Punch, Satin Ribbon a button and a brad. I love this envelope – so easy and so pretty!! I hope you’ll give it a try. See you soon! Lovely! Have to try this. Oh this is very versatile. I will use this a lot. I am so happy you give me some suggestions for the enveloppe. I like to give a card with an enveloppe and most of the time the card take all the attention. Not anymore. Becca, this is fab-u-lus!!!!!!! You video is so great and helpful. I will just have to try this for my daughter and son-in-law’s anniversary in March.. I always look forward to each of your posts every day and you constantly amaze me with your beautiful work. You’re such an inspiration to me and everyone who visits your. If this is the envelope what on earth id the card going to look like?!?!?!?!?!?! You have taken us one more step over the top, Becca! 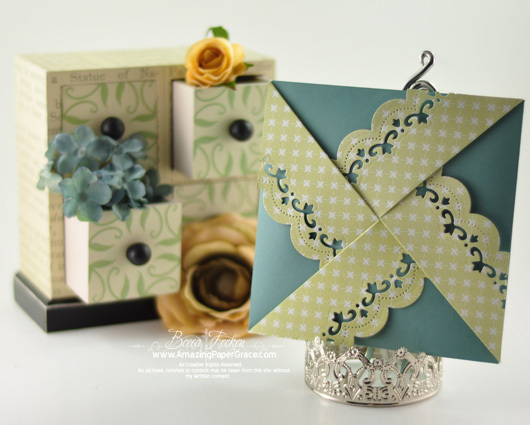 This envelope tutorial is fabulous! Thank you so much for sharing your awesome creativity. I really don’t know how you come up with so many beautiful and unique designs, but I think it’s wonderful that you are willing to share them with us. Fantastic tutorial on a lovely design! As usual, you have created another layer to complement your cards. Thank you for sharing all of your talent with us. I so admire you and your work. You’re have inspired me over and over! I’m also very impressed with your video presentations. They have become so professional. Thank you, thank you, thank you for sharing with us. STUNNING!!! Must say if I received the one with the rose I’d never be able to bring myself to open it. Again TFS a wonderful tutorial. this was such a great video tutorial, becca! i love all the samples too! 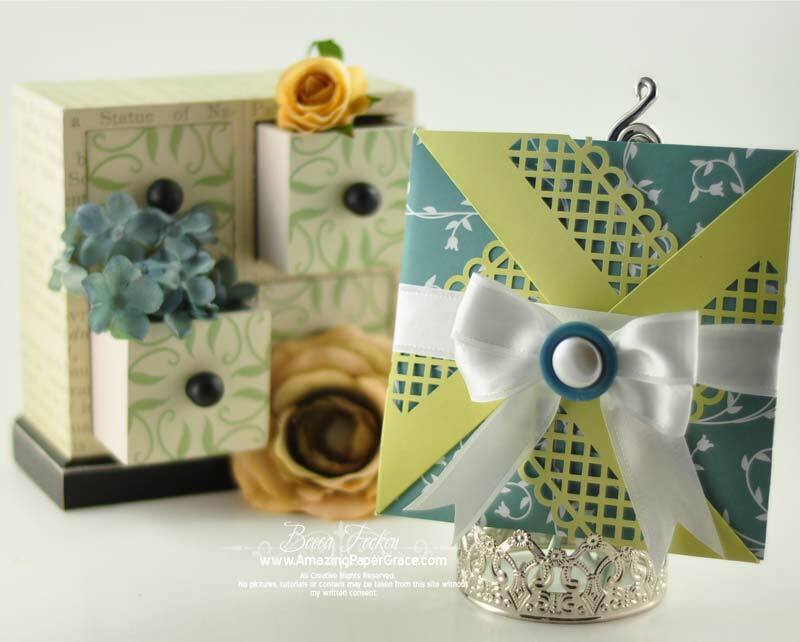 What a beautiful idea for an envelope, though it looks more like a gift! The tutorial, as always, is so clear and precise making it easy to follow, so thank you very much indeed. I will definitely be trying this idea out and I think I will be using it for wedding invitation envelopes. Take care of yourself whatever you are up to this week. Becca it’s so good seeing your tutorials again. It’s like watching a master at work. I don’t know how you do it. Talent and a gift..Thank you for sharing all your beautiful projects with all of us so we too can learn from you. Just beautiful Becca..it’s now a high art form. Thanks for sharing your creations once again. I always enjoy your video tutes. 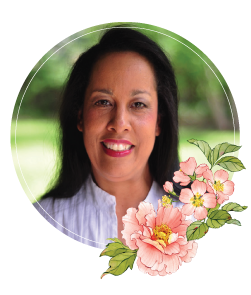 I have been a follower of yours for quite a while now and was wondering if you ever visit my blog for a look? Wonderful idea, beautiful presentations. I am going to give all 3 a try for sure. TFS. What a brilliant envelope. I love it. I made two boxes so now I will try this. I love a challenge. Thank you so much for a wonderful Tuorial. Becca, I tried your envelope and I am so pleased with it. It didn’t come out as beautiful as yours, of course! Your work is awesome! Thank you for sharing! Really like this envelop. Thanks for the tutorial. Can this be done for a 6×6 card??? Your creations are so wonderful. Thanks for sharing with us…..